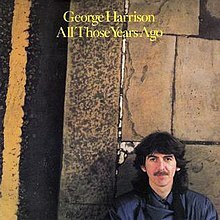 (1979) "All Those Years Ago"
"That Which I Have Lost"
"All Those Years Ago" is a song by English musician George Harrison, released as a single from his 1981 album Somewhere in England. Having previously recorded the music for the song, Harrison tailored the lyrics to serve as a personal tribute to his former Beatles bandmate John Lennon, following the latter's murder on 8 December 1980. The recording also includes performances by ex-Beatles Ringo Starr, on drums, and Paul McCartney (along with his Wings bandmates, Linda McCartney and Denny Laine), who overdubbed backing vocals onto the basic track. Released in May 1981, the single spent three weeks at number 2 on the US Billboard Hot 100 (kept off the top spot by Kim Carnes's "Bette Davis Eyes"), and peaked at number 13 on the UK Singles Chart. In addition, it topped Canada's RPM singles chart and spent one week at number 1 on Billboard's Adult Contemporary listings. "All Those Years Ago" was both the first recording on which Harrison, McCartney and Starr all appeared since the Beatles' "I Me Mine" in 1970, and the last recording on which they would all appear together until "Free As a Bird", in 1995. Other musicians performing on the track include Al Kooper and Ray Cooper. The song has appeared on the Harrison compilations Best of Dark Horse 1976–1989 and Let It Roll, and a live version recorded in 1991 with Eric Clapton was included on Harrison's Live in Japan double album. In 2010, AOL Radio listeners voted "All Those Years Ago" in sixth place on a list of the "10 Best George Harrison Songs". The track has been featured in the books 1,001 Songs You Must Hear Before You Die, and 10,001 You Must Download by Robert Dimery, and Bruce Pollock's The 7,500 Most Important Songs of 1944–2000. Prior to Lennon's death, Harrison originally wrote the song with different lyrics for Ringo Starr to record. Although he recorded it, Starr felt the vocal was too high for his range and disliked the lyrics. Harrison took the track back and, after Lennon's death, the lyrics were changed to reflect a tribute to him. In the song, Harrison makes reference to the Beatles song "All You Need Is Love" and the Lennon song "Imagine" ("you were the one who Imagined it all"). The recording of the song featured all three remaining Beatles (Harrison, Starr and Paul McCartney), though this was expressly a Harrison single. It is one of only a few non-Beatles songs to feature three members of the band. Harrison and Starr recorded the song at Harrison's Friar Park studio between 19 November and 25 November 1980. After Lennon's death the following month, Harrison removed Starr's vocals (but left Starr's drumming track) and recorded his own vocals with rewritten lyrics honouring Lennon. McCartney, his wife Linda and their Wings bandmate Denny Laine visited Friar Park to record backing vocals. The lineup was rounded out by Al Kooper on keyboards, Herbie Flowers on bass and percussionist Ray Cooper. The album's liner notes also thank the Beatles' former producer George Martin and engineer Geoff Emerick. Harrison co-produced the recording with percussionist Ray Cooper. The music video features a slide show-type presentation of stills and short archival video clips. The emphasis is on Lennon and, to a lesser degree, Harrison. The post-Beatles stills of Lennon at older ages are countered with stills of Harrison from the same time frame. ^ Dickinson, Boonsri. "10 Best George Harrison Songs". AOL. ^ "George Harrison 'All Those Years Ago'". Acclaimed Music. Retrieved 9 December 2014. ^ Rodriguez, Robert (2010). Fab Four FAQ 2.0: The Beatles' Solo Years, 1970–1980. Milwaukee, WI: Backbeat Books. p. 433. ISBN 978-1-4165-9093-4. ^ Madinger, Chip; Easter, Mark (2000). Eight Arms to Hold You: The Solo Beatles Compendium. Chesterfield, MO: 44.1 Productions. p. 460. ISBN 0-615-11724-4. ^ Badman, Keith (1999). The Beatles After the Breakup 1970-2000: A day-by-day diary. London: Omnibus Press. ISBN 0-7119-7520-5. ^ "Top Singles of 1981 (Australia)". Archived from the original on 9 December 2015. Retrieved 1 December 2015. ^ a b c d e f "George Harrison – All Those Years Ago". Norwegiancharts.com. Retrieved 20 September 2011. ^ "George Harrison". tsort.info. Retrieved 9 December 2014. ^ "Search by Artist > George Harrison" Archived 3 June 2009 at WebCite, irishcharts.ie (retrieved 11 April 2014). ^ "George Harrison – All Those Years Ago". charts.org.nz. Retrieved 9 December 2014. ^ "Artist: George Harrison". Official Charts Company. Retrieved 9 December 2014. ^ a b "Awards: George Harrison". AllMusic. Retrieved 9 December 2014. ^ "Cash Box Top 200 Singles". Cash Box. 27 June 1981. p. 4. ^ "Single – George Harrison, All Those Years Ago". officialcharts.de. Retrieved 9 December 2014. ^ "Item Display - RPM - Library and Archives Canada". Collectionscanada.gc.ca. Retrieved 17 October 2016. ^ "Top 100 Hits of 1981/Top 100 Songs of 1981". Musicoutfitters.com. Retrieved 17 October 2016. ^ "Cash Box YE Pop Singles – 1981". Tropicalglen.com. 26 December 1981. Retrieved 17 October 2016. "Bangla Desh" / "Deep Blue"
"Give Me Love (Give Me Peace on Earth)" / "Miss O'Dell"
"You" / "World of Stone"
"This Song" / "Learning How to Love You"
"All Those Years Ago" / "Writing's on the Wall"
"Teardrops" / "Save the World"
"Wake Up My Love" / "Greece"
"I Really Love You" / "Circles"
"I Don't Want to Do It" / "Queen of the Hop"
"Got My Mind Set on You" / "Lay His Head"
"When We Was Fab" / "Zig Zag"
"This Is Love" / "Breath Away from Heaven"
"My Sweet Lord" / "Let It Down"
"Any Road" / "Marwa Blues"
Music published by Oops Publishing and Ganga Publishing, B.V. This page was last edited on 23 January 2019, at 02:01 (UTC).